Ben took this call at 7:30 a.m. in a hotel in Australia and was surprisingly lucid. "My wife is just wondering what's going on, because I just shot up out of bed and started talking to myself," he said half-way through the interview. 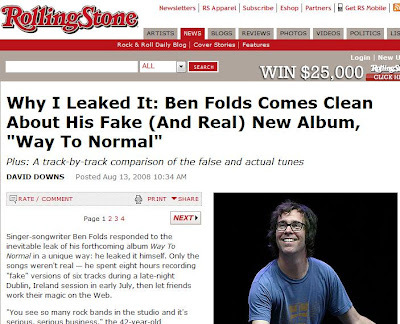 Talking with Ben Folds reminded me a lot of erudite, wry conversations with Ted from The Heavenly States. They need to hook up.